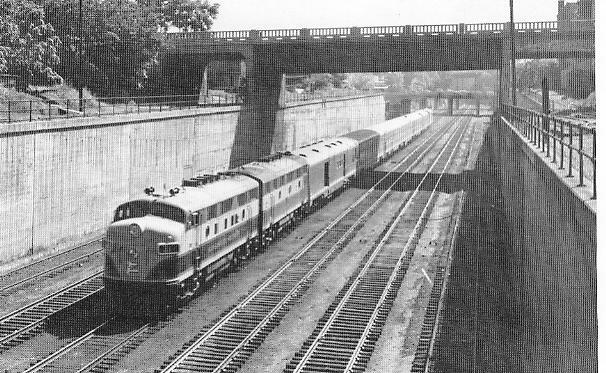 Kansas City Southern train in “trench” east of Union Station, probably taken in the 1950’s from Forrest Ave. Bridge. Note the six tracks in the trench. The next bridge east is Tracy Ave. Note the ramp which rises from the bottom of the trench on the right and comes up toward the viewer under Tracy Ave. and another one going back toward the east. These carried tracks from the trench level up to businesses on the right. 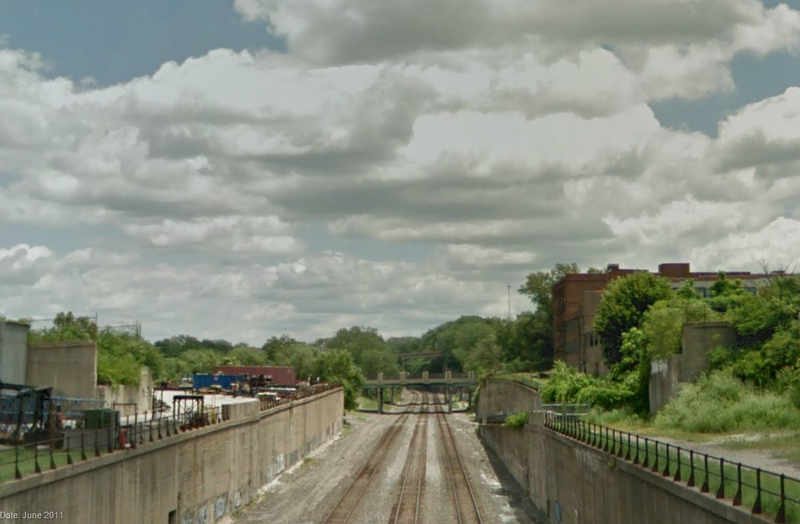 In fact you may be able to make out a freight car next to the brick building on the far right. Last month Jackson County Executive Mike Sanders announced that there would be no transit election this year. The decision was due to a newly emerged disagreement with Kansas City Southern Railroad concerning the location of the downtown terminus of the I-70 corridor commuter rail line. Based on earlier discussions with the railroads, the County was planning for a Downtown terminus near Third and Grand in River Market. Now, it appears, Kansas City Southern is insisting the line terminate at Union Station. Since Mr. Sander’s announcement, the Transit Action Network has noticed, in remarks by individuals as well as press accounts, a lack of understanding of the factors affecting the County’s decision. We decided to publish this note in order to provide those interested with more information about the choice of a downtown station site. The costs and benefits of the two options can be viewed along three dimensions: estimated ridership, commercial development potential, and cost. The chart below summarizes the two options for downtown locations in these terms. The Mid-America Regional Council (MARC) has completed four commuter rail studies over the past couple decades. The first of these studies examined the possibility of commuter rail in the I-35 corridor to the Southwest, in Johnson County. Union Station was to be the downtown terminus of this route. There has never been a problem getting to the station from the West. Although this corridor has always shown the greatest ridership potential, the I-35 project died because it basically required laying an additional track from Union Station to Olathe. Johnson County voters were not expected to support the high cost of such a project. View from Forest Ave. today. Note overgrown bridge abutments where the Tracy Ave. bridge used to be. 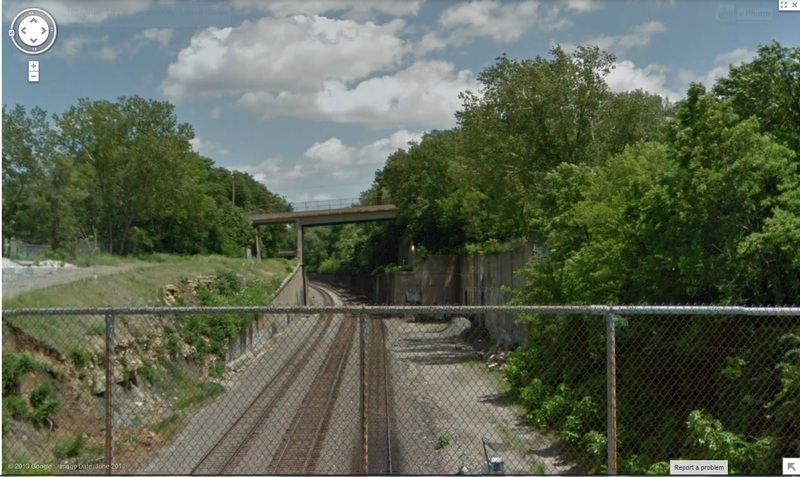 We assume railroad right-of-way extends approximately from the wall of the building on the left to at least the bridge abutment on the right and possibly to the building out of the picture on the right. This picture provides a better view of the old ramp system bringing tracks up to street level. The next MARC study in 2002 examined the possibility of commuter rail along various routes in both Kansas and Missouri. 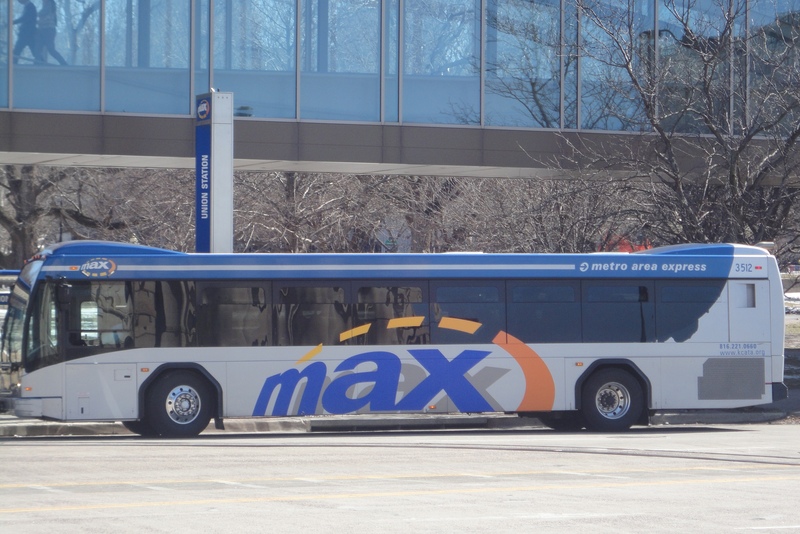 Of the routes studied the I-70 corridor was the most attractive in terms of potential ridership with a maximum of 4,160 passengers per day in 2020. This study assumed that the downtown terminus would be Union Station. There was no evaluation of the feasibility getting to Union Station compared with other locations. Grand Avenue bridge. An example of one of the bridges that would have to be modified in order to accommodate a fourth track. The next study, in 2007, focused just on the I-70 corridor, was far more detailed than the 2002 study, and examined both express bus and commuter rail. It used two different forecasting models with varying assumptions imposed on each. Using these models daily ridership estimates ranged from 815 at the low end for a station in River Market to 1,548 as a maximum for service into Union Station. It was in this study that the problem of getting to Union Station first surfaced. As the chart above indicates, it is extremely costly to get to the station from the east. (We will discuss the reasons for this subsequently.) So it was decided that a commuter rail route would preferably terminate in the River Market area. The problem with this was that the ridership forecasting models indicated, overall, about a 30% drop in ridership compared with Union Station. There were two reasons for this: First, commuters would have to transfer to buses to get to their ultimate destinations. (The downtown streetcar was not foreseen at the time.) Research suggests transfers between rail and bus cause a substantial drop in system use. Secondly, the combined travel time of commuter rail plus bus would be significantly longer than the drive time from a commuter’s home directly to their downtown office. Because of this and the large costs entailed in any rail system, commuter rail found no proponents and the idea withered. That brings us to County Executive Mike Sanders’ vision for expanding transit throughout Jackson County. The County Executive’s plan incorporates commuter rail, express bus, a greatly enhanced county-wide local bus system, and a system of bike and pedestrian trails. With the County Executive’s backing, MARC began the current study of the I-70 and Rock Island corridors in 2010. An additional study of the Highway 71 corridor was added later and is still underway. A series of ever more detailed study phases produced the most detailed information so far for both the I-70 corridor and the “Rock Island Corridor” to Lee’s Summit (and eventually, to Pleasant Hill). These two routes would come together in the southeast corner of the East Bottoms in the Blue River flood plain near an area called “Rock Creek Junction”. They would then proceed into the city on a “common line”, either to Third and Grand in the River Market or to Union Station (or vicinity). Woodland Avenue bridge (taken from the Vine Street bridge.) The “trench” narrows from here to its start at the 18th Street bridge. A fourth track at the same level as existing tracks would require excavation along one side of the trench. Getting to River Market requires acquisition of right-of-way from the City of Kansas City along the North side of Kessler Park, construction of a bridge over the Blue River and adjacent north-south mainline tracks, and construction of track between Rock Creek Junction and a station at Third and Grand. The cost is estimated, according to the draft “Locally Preferred Alternative” report prepared by MARC, at $113.3 million, including a station at Third and Grand costing $4 million. The Union Station route looks deceptively simple. The tracks to Union Station are already there at Rock Creek Junction. So, just run commuter trains on them. Problem solved, cost $0. But this idea is unlikely to work. The tracks through this corridor are part of several key nationally significant rail corridors. The problem is the corridor is already almost at capacity with well over 100 trains a day. Meanwhile, national rail freight traffic is expected to double over the next 20 years. The railroads will not allow their infrastructure to be used in a manner that interferes with their primary business of moving freight. So adding commuter trains, which demand close adherence to fixed schedules, in an already crowded corridor, is not viewed favorably by the railroads. Another option then is to build an additional track from Rock Creek Junction to Union Station. This turns out to be extremely expensive. According to a consultant working with the MARC team, who has looked closely at this alternative in the past, the cost would be around $1 billion – almost ten times the cost of going to Third and Grand! Here’s the problem. 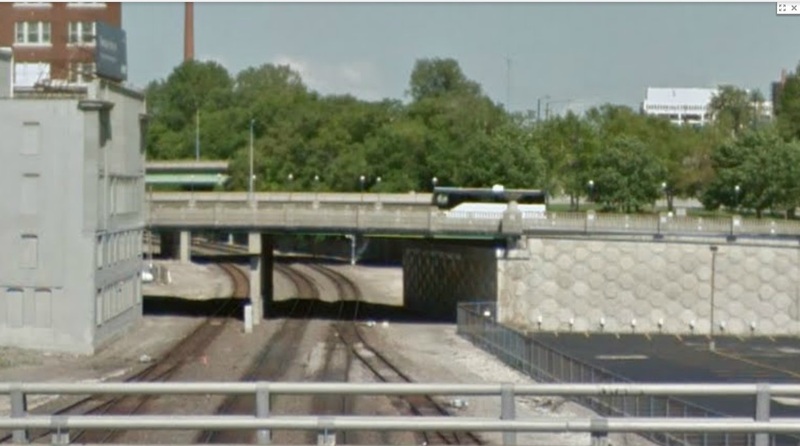 For approximately two miles east of Union Station the tracks lie in a “trench” (Grand Ave. to 18th Street, just east of the “Benton curve” on I-70). When Union Station was built, the trench contained four “thru” tracks. There were additionally two tracks on either side of the thru tracks which led to other tracks running up and down the sides of the trench serving rail shippers lining the right-of-way above track level. [See black and white photograph of arriving Kansas City Southern train taken from (we think) the Forest Ave. bridge in, probably, the 1950’s.] Today there are just three tracks in the trench. This is for two reasons: Revised safety standards have increased the distance between tracks thought to be safe, and changes in maintenance practices since 1914 require the use of rubber-tired, road-based equipment. So the trench now needs to accommodate a service road. Therefore, in order to add an additional track two things are required: 1. One of the sides of the trench would need to be excavated for at least part of the two-mile length, and 2. Most of the 15 bridges that cross the trench would have to be modified or rebuilt. [See photographs from Google Maps below to get an understanding of the topography and bridge constraints.] It is not difficult to intuitively understand the $1 billion figure. So is the commuter rail project dead? Very large infrastructure projects require the alignment of numerous parties’ interests and this inevitably creates hurdles along the way to an agreement. Currently, the railroads have agreed to contract for a third party capacity study of existing rail infrastructure. This might reveal that, contrary to the railroad’s beliefs, there is capacity for commuter trains on some basis. Or, perhaps a way will be found to add a fourth track in the trench more cost-effectively. Perhaps clearing the next hurdle may require just another healthy dose of creativity and/or negotiating acumen. Sometimes an idea just won’t work out and the effort has to be abandoned, at least temporarily, until conditions are more favorable. Given the time, money, and public commitment spent doing transit studies for Jackson County over the past few years, TAN hopes that some tangible transit improvements will result near term, even if commuter rail can not be immediately realized. These ridership estimates are far from comparable. They represent estimates from four different forecasting models performed over a ten year period, incorporating different relationships between variables, different parameters and different assumptions. Ridership forecasting models are notoriously inaccurate in any case. Today forecasting models tend to err on the side of conservatism so most, but not all, of the newer commuter rail systems have exceeded ridership forecasts; often times by considerable margins. The cost estimate for getting to Union Station was provided by one of the consultants involved in the current study. It was not prepared for the current MARC sponsored study. It’s date is unknown. Neither estimate includes cost of station, or station upgrades. Sources: MARC “Locally Preferred Alternative” draft and a consultant to the project team. The resolution is now in the House where a nearly identical resolution has been under consideration. We have heard reports that this one-cent sales tax proposal might not get out of the House this year, but that it might instead serve as the basis for an initiative petition campaign financed largely by highway interests. Thus, it’s important to continue to try to make this resolution as “transit-friendly” as possible. The resolution is not entirely to the liking of Missouri transit and bike/ped interests since it doesn’t include a specific percentage of the new revenue for non-highway purposes such as local and rural public transit, Amtrak and other inter-city passenger transportation, and improved accommodations for pedestrians and cyclists. However, it could turn out OK depending on what’s in MoDOT’s “list of projects” that will be prepared prior to the measure’s going on the ballot. Our impression is that MoDOT has become a whole lot more friendly to non-highway modes of transportation and thus all is not lost. Below is the “Current Bill Summary” from the Senate website, along with our annotations and comments [Italicized, in color and enclosed in brackets]. 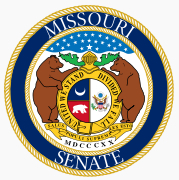 SS#2/SCS/SJR 16 – This constitutional proposal, if approved by the Missouri voters, would raise the state sales and use tax by one percent for a period of ten years. The proceeds from the additional sales and use tax [estimated to be a total of approximately $7.92 billion over ten years] are to be used for transportation purposes. The temporary sales and use tax measure must be resubmitted to the voters every 10 years until such measure is defeated. Five percent of the sales and use tax proceeds shall be deposited into the County Aid Transportation Fund, which is created in the state treasury by the resolution. Moneys in the newly created fund shall be distributed to the various Missouri counties in a manner similar to how motor fuel tax proceeds are distributed to counties. [A portion of existing state fuel taxes and other user fees is already distributed to counties.] The sales and use tax proceeds distributed to the counties may be used for local highways and bridges, state highway system purposes, or for county transportation system purposes (multimodal). In a similar manner, five percent of the sales and use tax proceeds shall be deposited into the Municipal Aid Transportation Fund, which is created in the state treasury by the resolution. Moneys in the newly created fund shall be distributed to the various Missouri cities, towns and villages in a manner similar to how motor fuel tax proceeds are distributed to such political subdivisions. [A portion of existing state fuel taxes and other user fees is already distributed to cities and other local jurisdictions.] The sales and use tax proceeds distributed to the cities, towns, and villages may be used for local roads and streets, state highway system purposes and uses, or for city transportation system purposes (multimodal). [For reference, our estimate of Kansas City, Missouri’s per capita share of the proposed sales tax is approximately $30.4 million over the ten years. Our $3 million estimate uses a distribution method based on population. Actual distribution of new revenue to cities and counties would be according to a more complicated formula. The remaining sales and use tax proceeds (90%) shall be deposited into a newly created trust fund known as the “Transportation Sales Tax Fund”. Moneys in the Transportation Sales Tax Fund may be expended by the commission for state highway system purposes or for state transportation system purposes and uses (multimodal). The resolution requires the one percent sales and use tax to expire in 10 years unless the sales and use tax is renewed by the voters. If the decennial sales and use tax measure is ever disapproved by the Missouri voters, the sales and use tax will terminate at the end of the year following such election. Unless approved by the voters, the General Assembly, counties, and municipalities are prohibited from increasing or decreasing the motor fuel tax from the rate of the tax authorized by law on January 1, 2013, while the sales and use tax is in effect. Unless approved by the voters, the commission shall not own or operate a toll highway or toll bridge on a state highway or bridge that is in existence on the effective date of this resolution while the sales and use tax is in effect. A similar provision applies to counties and municipalities. Unless approved by the Missouri voters, counties and municipalities are prohibited from tolling existing highways or bridges under their jurisdiction during the duration of the sales and use tax. The act requires, prior to any election to which the sales and use tax proposal is submitted to the voters, the commission to approve a list of projects, programs, and facilities on the state highway system and state transportation system that will be funded from the additional sales and use tax proceeds. Starting in the 1st fiscal year following voter approval of the resolution, the commission shall annually submit a report to the Governor, General Assembly and the Joint Committee on Transportation Oversight that shall include the status of the approved list of projects, programs and facilities on the state highway system and state transportation system. In the annual report filed in the 6th fiscal year following voter approval of the resolution, if the Joint Committee on Transportation Oversight identifies and determines that any project, program or facility on the commission’s approved list has not yet been included in the commission’s statewide transportation improvement program, then the joint committee by two-thirds majority of its members, shall identify each specific project, program or facility that has not been included in the commission’s statewide transportation improvement program and shall within 30 legislative days recommend suspension of appropriations from the transportation sales tax fund in an amount that is equivalent to the amount of funds necessary for each specific project, program or facility that was not included. Under the resolution, the General Assembly may approve the recommendation of the joint committee by enactment of a concurrent resolution. Such resolution may be introduced in either legislative chamber no later than 14 calendar days after receipt of the joint committee’s recommendation. The resolution shall not be subject to amendment by either chamber and may only be approved in its entirety. The presiding officer of each legislative chamber in which a concurrent resolution has been introduced, shall submit it to a vote of the membership not sooner than 7 calendar days nor later than 14 calendar days after introduction of the concurrent resolution. The presiding officer of the chamber passing a concurrent resolution shall immediately forward the resolution to the other chamber and the presiding officer of that chamber shall submit it to a vote of the membership not sooner than 7 calendar days or later than 14 calendar days of its receipt from the other legislative chamber. Any suspension of the appropriations from the transportation sales tax fund shall be null and void when the highways and transportation commission amends its statewide transportation improvement program to include each project, program and facility identified in the joint committee’s recommendation. 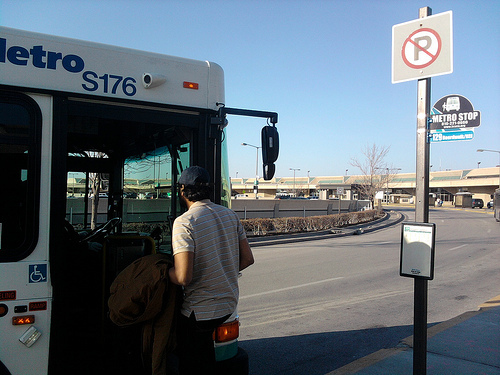 Expanded Route 129 service to KCI Airport began on March 31, with hourly trips connecting Downtown Kansas City with KCI seven days a week, 19 round trips per day. Buses now also serve all three terminals. Passenger boards southbound Route 129 bus to Downtown Kansas City. We’d give you an approximate gate number for each stop, but KCI Airport does not have a consistent system of location reference points outside the terminal buildings. We consider that to be a serious oversight on their part. Perhaps some of our local “frequent flyers” can help persuade the KCI folks to do better. Note that there’s relatively little information on the KCATA schedule poster, even though it’s more than half blank. No hint of destination (Downtown at 10th and Main Transit Center), or travel time (less than one hour), or fare ($1.50), or transfer policy (free transfer good for two hours). Nor is there a route map, or even a simple “stick map.” Such information would be immensely helpful to out-of-town travelers who just naturally expect to find a low-cost public transit connection from a major airport to a city’s Central Business District. Buses from Downtown (via Boardwalk Square) loop around each terminal before making a final stop at Terminal C. Then they pull forward and wait near the ICE (Immigration and Customs Enforcement) office until their scheduled departure time several minutes later. Because this dwell point is not at the curb, drivers would probably not allow a late-arriving passenger to board. We looked for information about this KCATA service inside the terminal buildings but couldn’t find any. KCATA used to have a colorful panel at each of the nine information kiosks (one opposite each baggage carousel), but those panels are no longer present. All in all, even though there are details to be improved, we applaud KCATA for this new transit connection.